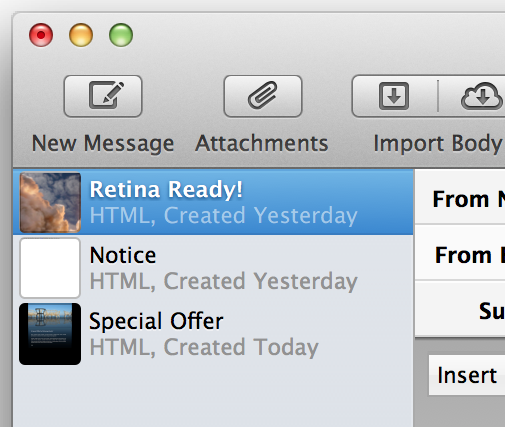 Direct Mail 3.2 Brings Design Testing, Retina Graphics, and More! As you might have heard by now, today marks the release of Apple’s latest and greatest Mac operating system: OS X 10.8 Mountain Lion. We thought we’d add to the excitement today by launching a feature-packed update to Direct Mail that we think you’re going to love (oh, and it’s ready for Mountain Lion, too)! The release notes hold the details, but we wanted to highlight two features that we’re particularly excited about: Design Testing, and brand new Retina graphics. Direct Mail comes with a wide variety of templates that you can use to build your newsletters and announcements. 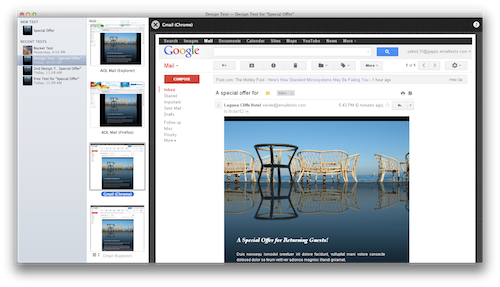 We’ve tested these templates to make sure they look great in all of the popular email clients. However, if you have your own designs, or if you want to see how your modifications look in all the popular email clients, we have a great new solution for you: Design Tests. 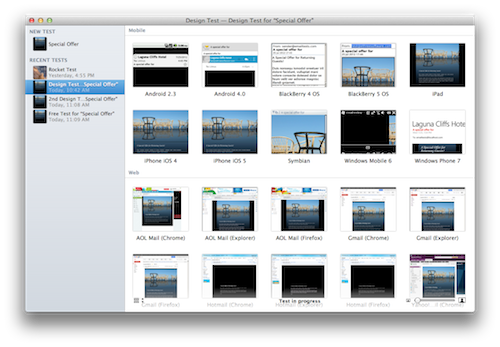 Thumbnail view gives you an easy way to preview your message in over 30 of the most popular email clients, including mobile, web, and Windows clients. Design Tests show you what your email looks like when viewed on a variety of popular email clients, including Windows, web, and mobile email apps. Use Design Tests to easily track down design problems, or optimize the length or style of your newsletter for the email clients that are popular with your subscribers. Zoom in from thumbnails all the way to full-size screenshots of what your email looks like in Gmail, Yahoo Mail, Outlook, iPhone, Android, and more! To use Design Tests, choose Message > Design Test from the menu bar, or click the Design Test button in the toolbar. We’ve made Direct Mail shine from top to bottom with crisp Retina graphics. If you’re lucky enough to own one of the new MacBook Pros with Retina display, then you will love how Direct Mail looks on your screen. As Apple rolls out the Retina display to more Macs, Direct Mail will be ready! Enough talk, already! You can grab this update (it’s free) by choosing Direct Mail > Check for Software Update from the menu bar. Mac App Store customers will have to wait a little longer while Apple reviews and approves this update.